Most dogs love peanut butter, but what about nuts? 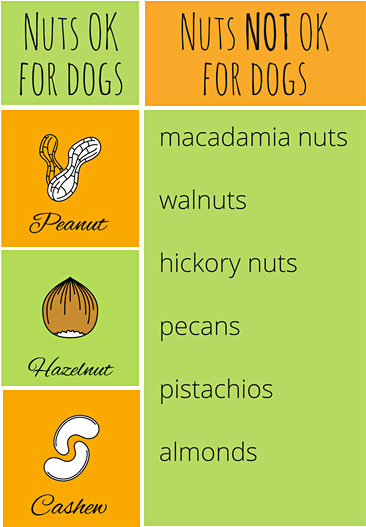 Can dogs eat nuts safely? The answer is, yes they can eat SOME nuts but others are dangerous. 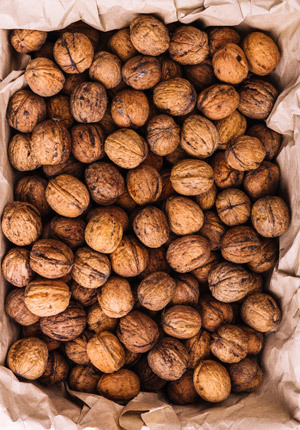 most tree nuts are infected with low levels of mold, including pistachios, walnuts, hickory nuts, and pecans. Moldy nuts contain aflatoxins, which can lead to lifelong health troubles for your dog, including liver failure. 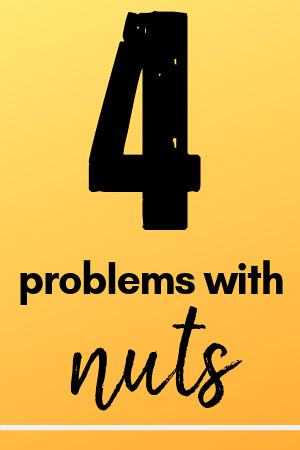 large nuts, like whole pecans and walnuts, can actually block your small dog’s stomach or intestines, causing tremendous digestive system problems. dogs with sensitive stomachs or a condition like pancreatitis shouldn’t have nuts because they can lead to discomfort and diarrhea. These delicious buttery nuts from Hawaii and Australia are THE worst thing for a dog. Why? They contain an unknown toxin that attacks the nervous system, causing severe neurological problem. Your dog might appear drunk, staggering all over; or he may lose his ability to walk (temporarily or permanently!) Severe vomiting and weakness can also be symptoms. If you suspect your Morkie has eaten macadamia nuts, see the vet at once. 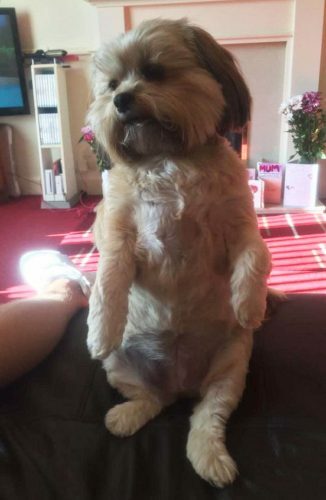 Almonds aren’t as dangerous or deadly but they can cause a lot of digestive upset for your Morkie, along with the choking possibility. Pistachios are “OK” except if they are mouldy and this type of nut is susceptible to mould. Not enough for us to notice, let alone affect us but for a small dog, they can mean trouble. Cashews don’t contain anything particularly poisonous to dogs but they ARE high in fact which can lead to obesity and even kick start pancreatitis in your small dog. Brazil nuts are THE fattiest of all nuts, so again, should be avoided because of the risk of pancreatitis. “Black Walnut. Black walnut is a very effective natural dewormer, but it can be harsh on your dog’s system, so keep it for cases that don’t improve with the more gentle solutions listed above. 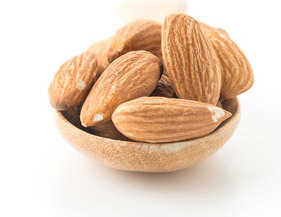 The AKC says avoid almonds for your dog because they can cause digestion problems even though they aren’t as toxic as some nuts. If your Morkie gets into almonds, expect him to have an upset stomach, pain in the stomach, gas and possibly diarrhea. 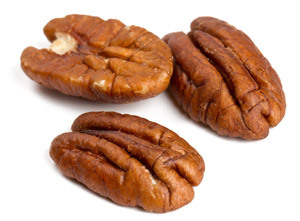 Pecans are bad for dogs because they can cause aflatoxin poisoning. Symptoms include loss of appetite, lethargy, vomiting, colored urine and jaundice, liver failure, blood-tinged vomit, and bloody or blackened stools. What about peanuts and peanut butter? 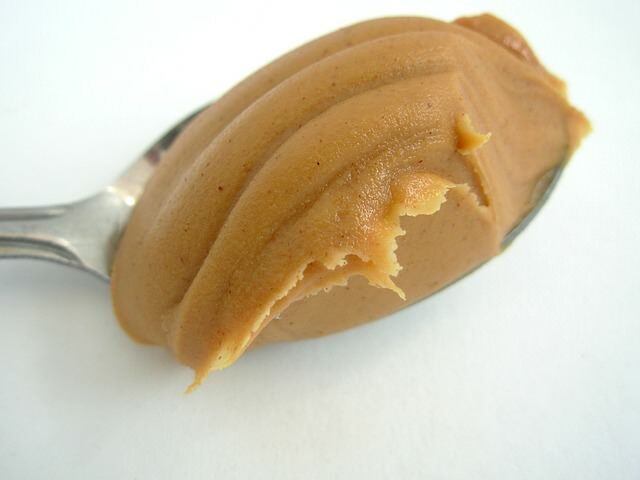 Peanuts and peanut butter are NOT toxic to dogs – because they’re not nuts. But don’t feed your Morkie too many, because of their higher fat content. Avoid salted or seasoned peanuts. Peanut butter is another treat dogs seem to love, and it can be an occasional treat or used in making dog biscuits. 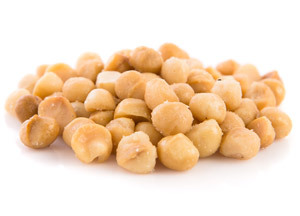 While “nut” is in their name, peanuts are legumes just like kidney beans, peas or lentils. Peanuts grow underground, while most other nuts grow on trees. 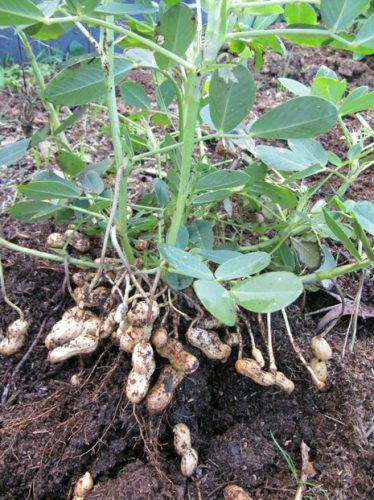 Here’s how peanuts grow – underground from the green leafy peanut plant. The One Peanut Butter that IS Bad for Dogs - Very Bad! More and more manufacturers are offering ‘low cal’ peanut butter. 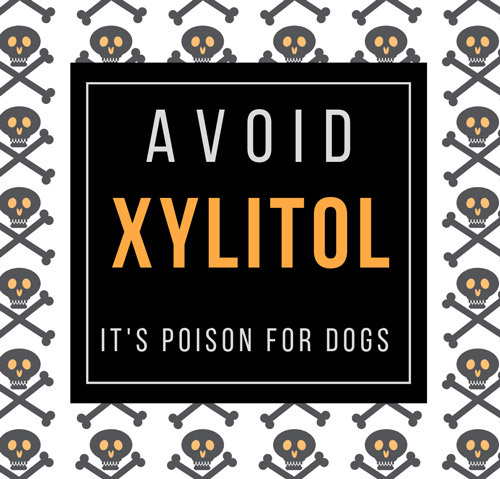 It’s made with XYLITOL, a sugar substitute which is HIGHLY DANGEROUS to dogs. Please watch for this ingredient on a number of foods and candies that your Morkie might get into. Instead of nuts, try your Morkie with a small piece of your favorite fruit – apple, banana, peach. (NOT grapes). Or try some veggies including a bit of carrot, celery or a green bean. No matter how healthy a snack might be, remember the 10% rule – only 10% of your Morkie’s total calories per day should be made up of snacks. The rest should be a balanced dry or wet food or a combination. What is the best dog food for your Morkie? Find a lot more information on human foods your dog should avoid on the site, Fido’s Favorites. Plus you’ll find other helpful articles there. Small breed dog food – does your Morkie need it? Small breed dog food is the latest spin manufacturers are putting on commercial pet foods… but do small dogs need a special diet? And why are these so formulas much more money than food for ‘full size’ dogs? More about the industry’s latest scheme. There are dozens of special foods on the market now specially made for toy dog breeds; they are the latest from manufacturers like Wellness, Nutro, Blue Wilderness and a host of others. But are they actually unique? And does your Morkie need to be on one of these small breed dog foods? Today’s dogs are meant to eat MEAT. But plant material can’t hurt them, just fill them up. That’s something small dogs do not need; instead, every bite they eat should be maximum nutrition. Dogs are carnivores, not matter their size. Some experts say they are also omnivores – or eaters of just about anything. Their teeth are definitely for eating meat. But their intestines are longer than cats, who are true carnivores. So dogs CAN digest some amount of plant material. A dog’s ancestor, the grey wolf, is primarily a carnivore. But dogs adapted over time to be scavengers, picking up the leftovers from humans, and generally eating whatever they could find. Meat was preferred, but not too many dogs will turn down a biscuit. Any food with corn as its first ingredient, is not top quality nutrition. Corn is used for one reason only – it is an inexpensive filler. Corn is a contentious subject in the world of dog food, Some experts claim dogs can get nutritional value from corn; others say, they can’t really digest corn, so it’s of little value. Corn is a cheap filler, and small dogs like Morkies don’t need fillers. Every bite they eat should be nutritious since they’re so small. What ARE the nutritional needs of a toy dog? Toys need a quality diet of protein, fats and carbohydrates*. Carbs are starred, because they’re not technically NEEDED, but are usually the carriers of important vitamins, minerals and plant-based nutrients. But guess what? Any size dog needs a quality diet of protein, fats and carbohydrates. How important is small size kibble? 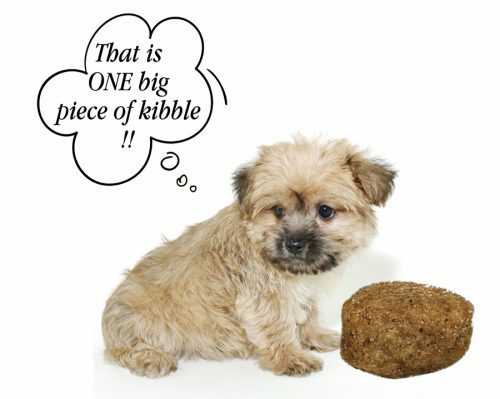 If you feed your Morkie a dry diet (kibble) how important is the SIZE of the kibble pieces? Many Vets recommend that you add water – an equal amount as the kibble – to the meal before you give it to your dog. That’s because kibble diets can be very drying and can even result in dehydration. So if you follow that advice, the size of the kibble doesn’t really matter, since it will soften right down. Otherwise, the kibble size shouldn’t be an issue. Look at how a toy dog will grab onto a meaty raw bone and you’ll see there’s nothing too big for these guys! add at least some fresh food to your dog’s diet, by hand; a little bit of beef or chicken (raw or cooked); veggies your dog might like and even fruit. Let's sum up: does your Morkie really need small breed dog food? Being labelled for toy dogs, doesn’t mean the food is superior than regular dog food. Always check the label carefully – especially the first 5 ingredients. They are what matters most. You want to see real meat products named, not “meat by-products” or “meat meal.” Instead look for beef, chicken, lamb, etc. And avoid anything called a by-product. If the food checks out, and there is a small dog version available (at the same price), then go for it. Otherwise, stick to a regular, quality food. 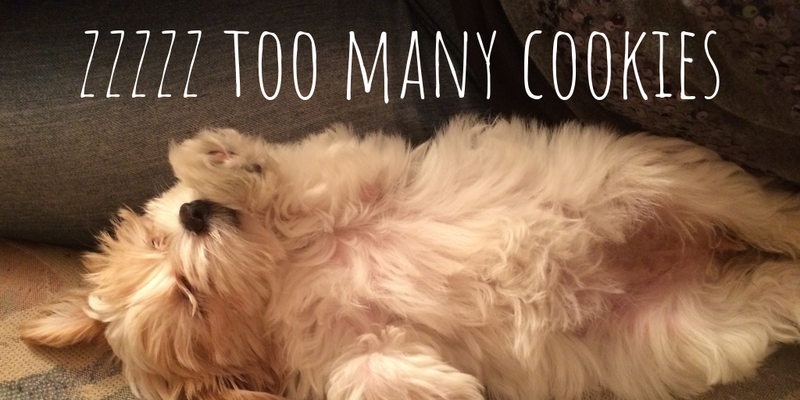 If you feed your Morkie commercial food, you’ll want this list. Download it here free. 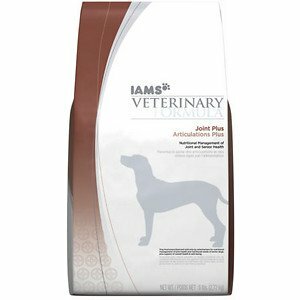 Prescription dog food – legit or scam? Do small dogs need special food? What’s the best DRY food for your Morkie? 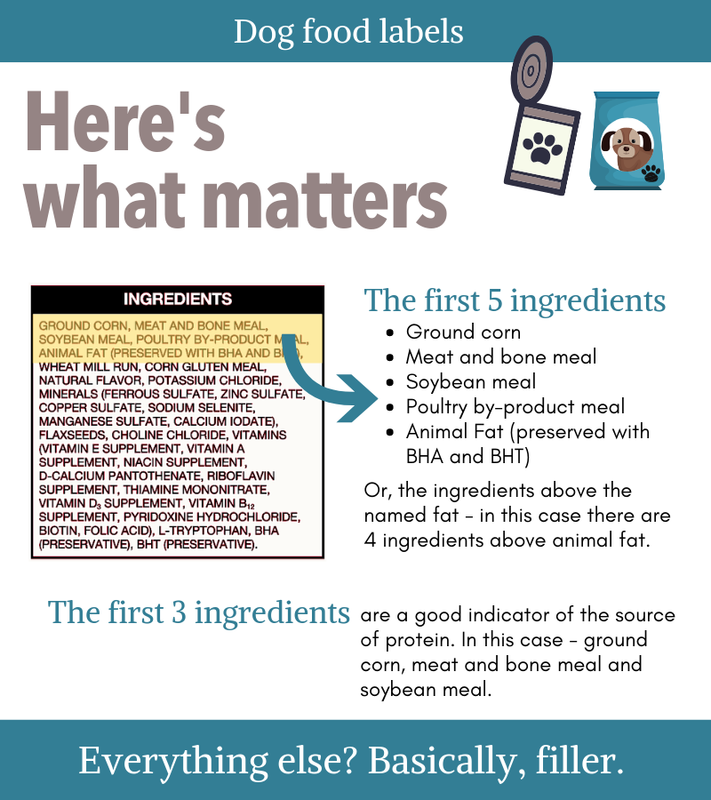 When you look closely at the ingredients, it’s pretty clear that in nearly every case, prescription dog food is just regular food with a new label and a much bigger price tag. Sure, there are some extra ingredients, but they are WAY down on the label. These “new” dog foods aren’t really new, and they aren’t designed with your dog’s health first. They’re designed to increase PROFITS for pet food manufacturers. Before you shell out big bucks for these specialty foods, take a closer look and be sure you’re not being manipulated by this multibillion dollar industry. Dana Scott from Dogsnaturallymagazine.com has just written an extensive review of prescription dog food, versus regular store food. It’s hard to see how prescription dog food, or veterinary diets, are worth the premium pricing. Here’s an example from dogsnaturallymagazine.com. So, as you can see, the main ingredients are the same in both foods. What’s different? THE PRICE! In most markets, the prescription food is almost TWICE AS MUCH MONEY as the regular food. As with all my columns, this information is for your consideration. Please do not make changes to your dog’s diet, medication or exercise plan without consulting a professional. Our pets are getting progressively fatter and sicker eating processed pet food. Your Morkie is a carnivore and needs quality meat. Yet commercial food can be nothing but empty calories, and stuff like CORN which isn’t what dogs need. Or worse, processed dog food can contain carcinogens, triggering cancer. Dr. Karen Becker, of healthypets.Mercola.com offers a NEW list of Best to Worst Ranking of 13 Pet Foods. From the best – Nutritionally balanced raw homemade diet to the worst, an unbalanced homemade diet, raw or cooked. 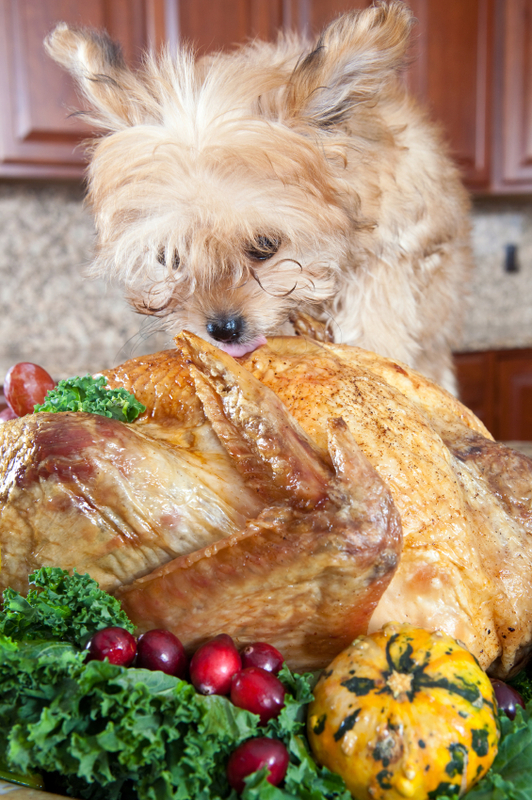 What’s the best dog food for small dogs? And do small dogs need special food, or is any good dog food OK? 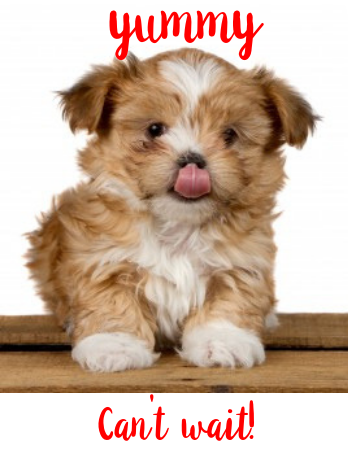 Here are 5 top questions about dog food for small dogs like Morkies. 1. 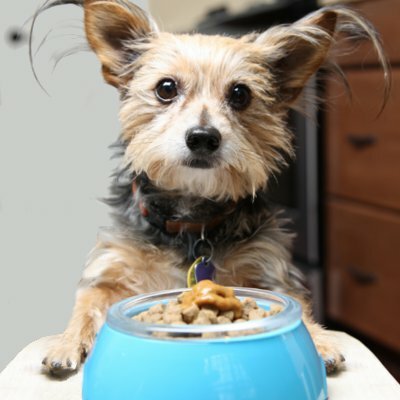 Is kibble or canned better for small dogs? 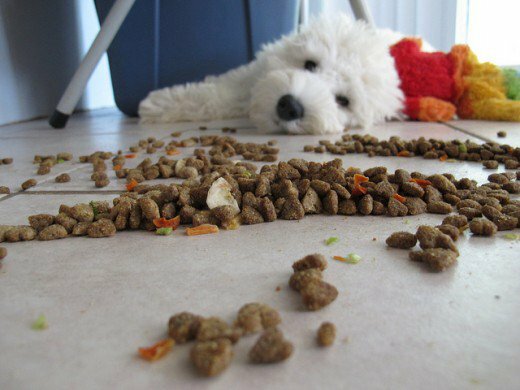 Just like us, dogs can get bored eating the same thing, day after day. So switch it up with different brands, and don’t hesitate to use both kibble and wet food together. 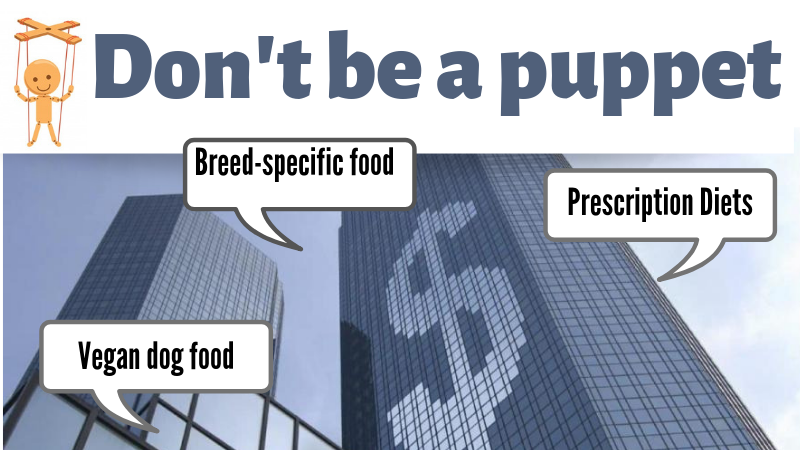 If you’re buying commercial dog food, look for quality ingredients, whether you’re buying kibble or canned (wet) food. What makes up “quality ingredients?” Pick food with a ‘real’ source of protein in the first 5 ingredients. For example, beef, chicken or salmon. 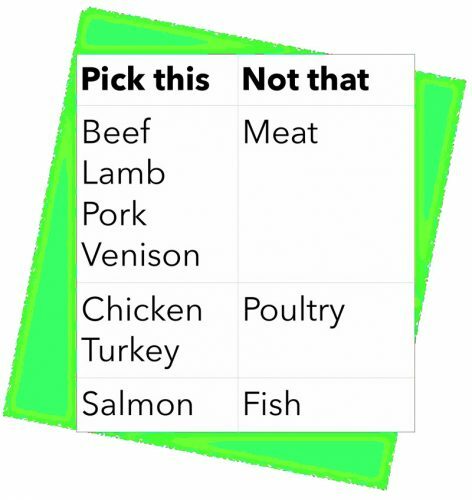 AVOID food that is labelled “meat” “poultry” or “fish.” AVOID meat by-products (named or not). AVOID: bone meal, meat meal, corn high up on the label, and food that includes a ‘flavour.’ Why? Because that flavour is usually added to disguise the poor quality of the main ingredients. If a dog food is made with chicken, why would you need to add chicken flavour? How are ingredients ranked on a dog food label? All ingredients must be listed in order of predominance by weight, including the ingredient’s water. So without a complex formula which removes the weight of the water in the dog food, it’s not fair to compare a dry food with a canned food. However, kibbles can be compared to one another, and canned foods can be compared fairly. Above the named fat – another way to look at it, is the ingredients above the named fat, are what matter. 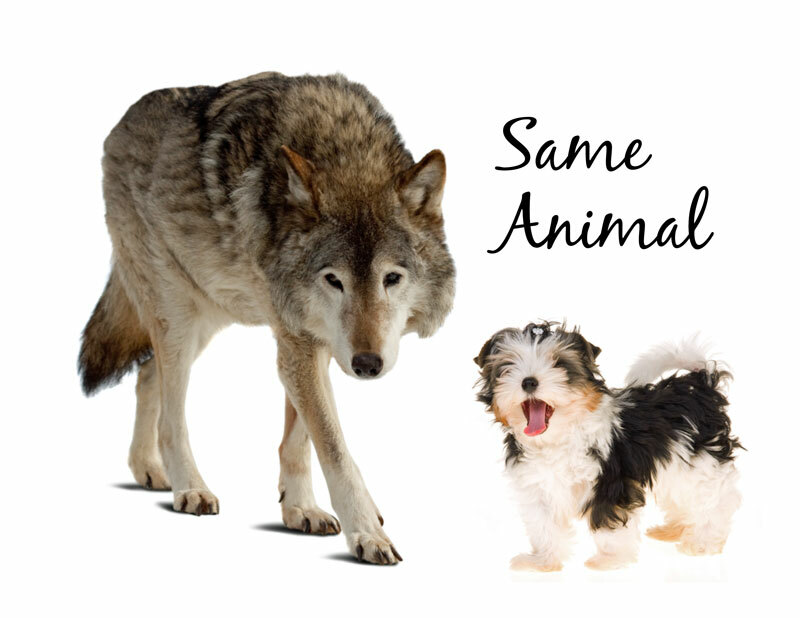 Small dogs need all the nutrition a big dog does, but with a difference. Small dogs actually need to eat more calories for their body weight, than larger dogs. That’s because smaller dogs usually have faster metabolisms and will burn off energy at a faster rate than larger dogs. For example, a Maltese needs more than twice as many calories per pound as a Great Dane. 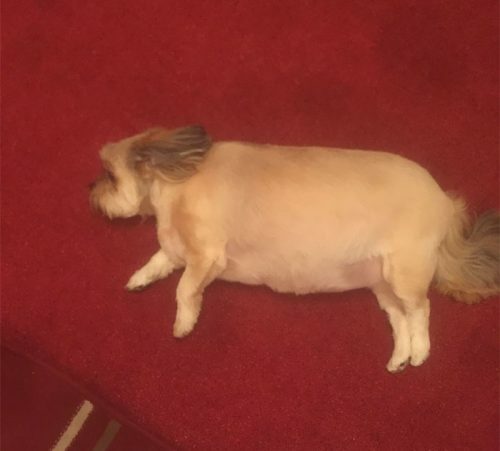 Since small dogs are, well, small…. they can’t afford to fill up on low-quality ingredients like corn and other grains. Another reason you need the best dog food for small dogs. 3. Are breed-specific foods worth it? Spoiler alert: Nope. What matters is that the food is species-specific… that is, it’s made for DOGS. You might wonder sometimes, when you see ingredients like CORN first on the dog food label. When’s the last time you heard of a wolf breaking into a farmer’s field, shucking a few cobs and feasting on corn? Like never. 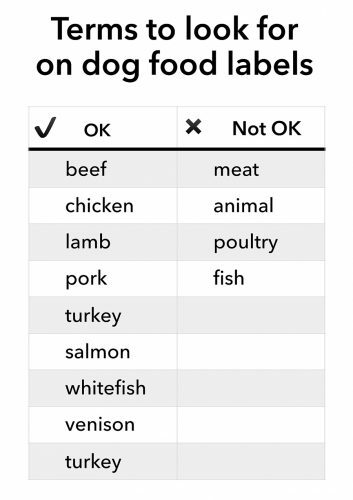 This doesn’t stop manufacturers from extending their pet food lines with plenty of silly options, like breed-specific food. 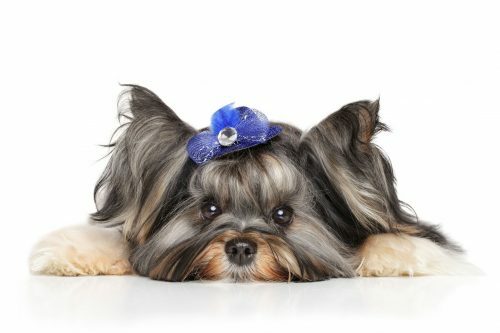 Let’s look at two dry foods specifically for Yorkies, compared to a premium brand for small dogs. Chicken as the first ingredient is excellent. Meal is a concentrated version of the meat named, and so delivers excellent protein value; however, poultry by-products are the really ghastly parts like beaks and feet. Corn meal is the third ingredient, and it’s a controversial one. 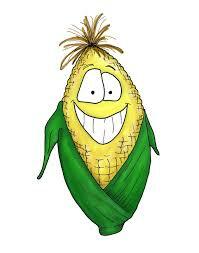 One thing we do know is, that as a whole grain, corn is not easily digested by dogs. Sorghum is usually fed to cattle and Brewer’s Rice, or broken rice, are the broken bits of regular rice, which are rejected for people. They’re OK, nutrition wise, for pets. All in all, a pretty average food. 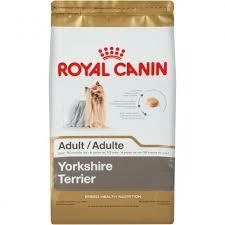 This is a medium quality food, heavy on the carbs which small dogs like Morkies don’t need. 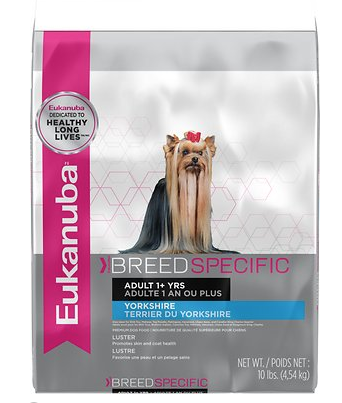 My personal opinion is that this ranks well below the just-average Eukanuba, at left. Premium natural ingredients, with no wheat, corn, soy preservatives or artificial colours and flavours. Provides energy without all the carbs, thanks to high-quality protein. 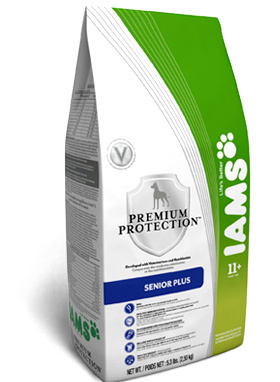 Complete with probiotics, glucosamine, Omega fatty acids for coat health, antioxidants and more. AND, IT’S CHEAPER PER POUND THAN THE BREED-SPECIFIC FOODS. 4. Should I pick a food that’s specially made for small breeds? 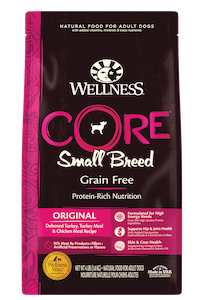 Some kibble comes in smaller sizes for smaller dogs, like the Wellness Core, above. That’s not a bad idea, as long as the food itself is high quality. Other than the size of kibble, there’s no reason small dogs need a different recipe than their big friends. A frame from the latest Cesar Dog Food commercial. Some foods are specially marketed to small dog owners. Cesar Savory Delights is a good example. 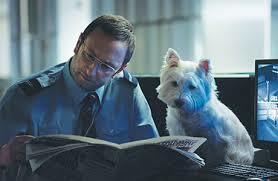 Ads feature a single man or woman, alone with their soulmate, a tiny dog. These ads are targeted at the GenX/Boomer pet parent, who is lonely, but thankfully, has his fur baby for company. 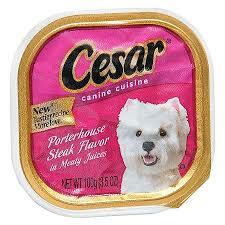 So naturally he wants the best for that dog – and the implication is, that’s Cesar! This food is one of the poorest quality on the market. Why? beef by-products – which is industry-speak for slaughterhouse waste. This isn’t meat, it’s the leftovers, rejected for hot dogs. Can include lungs, brain, intestines, even tumours! animal liver – the animal isn’t named, so it could be anything, including any combination of pigs sheet, goats and horses. meat by-products – slaughterhouse waste again, but from what animal??? Could even roadkill! bacon – the cured fatty meat from the belly of the pig. Hmmm. 5. 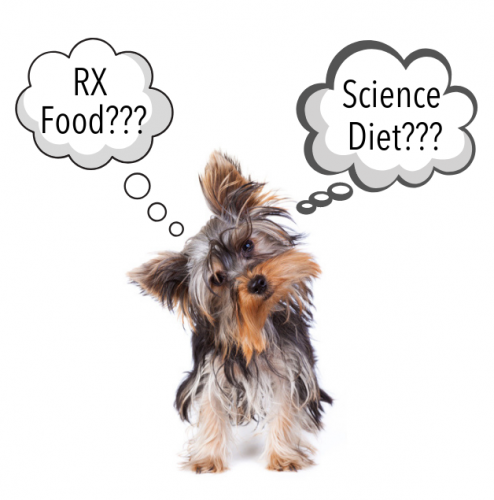 Can small dogs handle a RAW diet? It’s important to handle raw meat carefully; especially for YOUR health. Your dog may love it, but raw meat is still full of potentially harmful toxins, bacteria and even parasites. Dogs are more resistant, but they’re not immune to some of these dangers. A RAW diet isn’t without digestion problems either, especially when you get started. Launching a new feeding regime can be tricky. And the number one issue: ensuring your Morkie gets the right nutrition. For a RAW diet, this takes a lot of planning and knowledge to balance the ingredients, and ensure all the micronutrients and vitamins and minerals are delivered in a RAW diet. Next: 'Prescription' or Veterinary Diets - Scam or Solution? 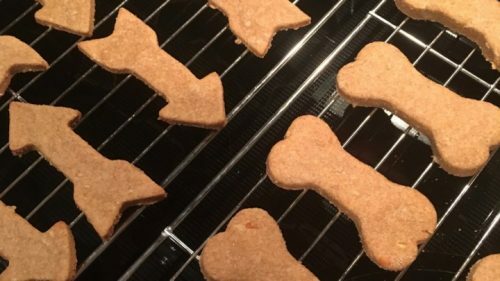 Want to make your own homemade dog treats? As we saw in the last post, commercial dog treats and jerky snacks can be sketchy. And rawhide bones are really dangerous! 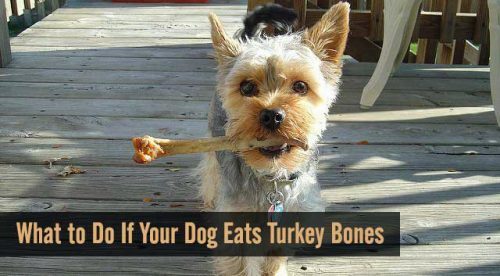 So make your own and you can count on quality dog treats for your Morkie. 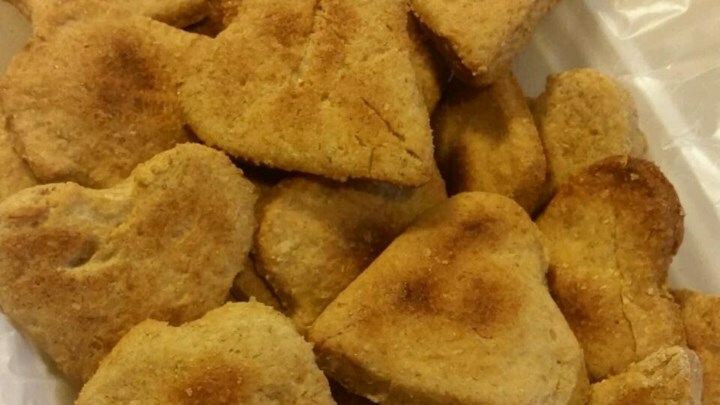 Over the holidays, you might get a chance to make your own homemade dog treats. Here are my favourite recipes, in handy downloadable format. Plus a template you can download, if you want to make your own cookie cutters too. 1. Cut up an empty pop can, into 1″ wide strips. Bend the top edge over about 1/4″ or cover with masking tape to protect your fingers. Shape, tape it and voila – cookie cutter! 2. 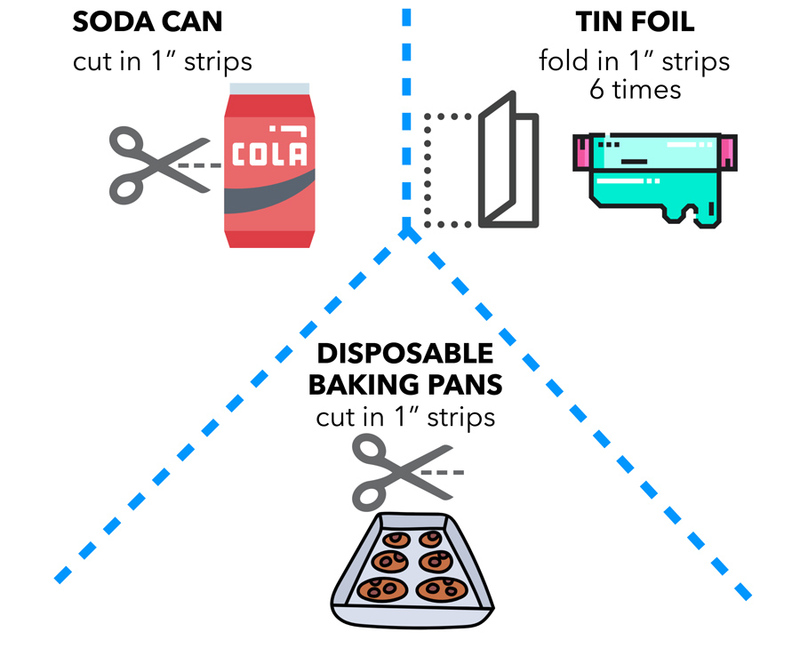 Use a disposable foil baking tray to cut 1″ long strips of foil, and bend them to your design. 3. Simple tin foil, folded 6 times into a 1″ wide strip. Be careful of the tin edges; they can be sharp. These are very healthy and high in protein. Plus, they’re grain free – perfect for the Morkie with allergies. Mash banana, then beat in eggs and then peanut butter. In a separate bowl, combine chickpea flour, coconut flour and baking soda. Gradually add the flour mixture to the banana/peanut butter mix. When well blended, roll the dough out to 1/4″ thick and use your favourite cut outs to make cookies. Bake for 14 minutes until treats are golden brown. Remove and let cool completely. Store in a sealed container. 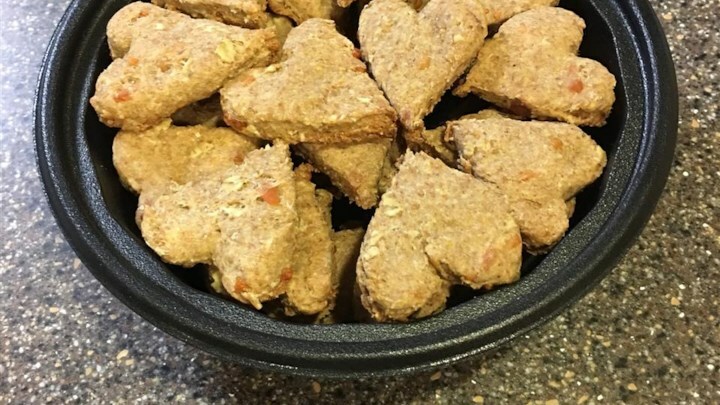 This recipe, from Blue Pearl Vet, looks good enough for us to eat. In fact…. ½ cup unsweetened pumpkin puree – canned. Not the pie filling; just pure pumpkin. Mix all three ingredients together and knead. Add extra flour if the mixture is too sticky. Roll out to about ⅓” thick then cut into squares with pizza cutter. Bake for 15 to 20 minutes or until crunchy and golden. 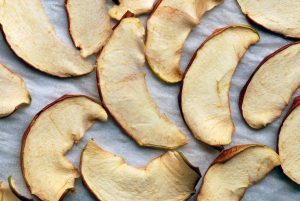 Slice fresh apples very thin, carefully removing all seeds and stem. 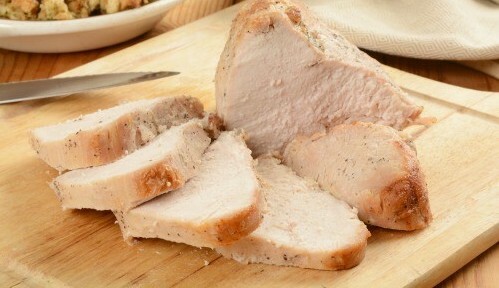 Place on a baking sheet in a single layer, and bake at 150º F for about 5 ½ hours. Please download your free recipes, and cookie cutter template. Slice a sweet potato into pieces of ⅓ inch thickness. Cut the sweet potato crosswise for smaller, round coins. Lay the slices onto an ungreased baking sheet lined with parchment paper, and bake at 250º F for 2 or 3 hours until they are dry with crispy edges. Flip them halfway through baking to ensure they cook evenly. 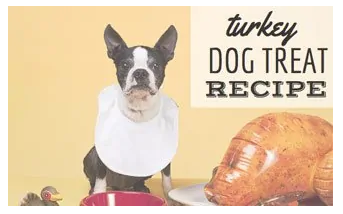 Cool and serve to your dog. Store in a sealed container in the refrigerator. Got a favourite recipe you’d like to share? Please post below.